In order to help our patients preserve the maximum amount of healthy dental structure, we use a variety of restoration services. Theses include dental crowns and fixed bridges to repair and replace teeth following decay or damage. At Sachse Family Dentistry, our skilled dentist, Dr. Rottman and his team will work with you to find the right restorative materials and treatments to renew oral health and return the smile to your face. Call our team to schedule an appointment if you experience tooth decay or damage. We’ll begin repairing your smile right away to preserve as much healthy structure as possible. Dental crowns are restorations crafted to fit over the top of damaged teeth. We may recommend dental crowns to repair teeth following tooth decay, dental damage or wear, root canal therapy, or to conceal purely cosmetic concerns. Fixed bridges combine a row of dental crowns fused together in order to replace one or more consecutive missing teeth. Fixed bridges can be supported by surrounding healthy teeth or attached to dental implants. 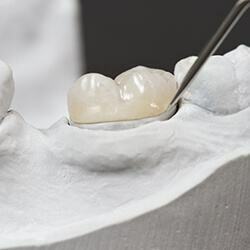 We create restorations from a variety of materials including gold, porcelain fused to metal, and ceramic. We’ll work with you to choose the best restoration material to meet your needs. The creation and placement process is completed over the course of two appointments. During the initial visit, we prepare the tooth, capture bite impressions for the lab, and place a temporary to protect the prepared tooth. Once we receive our final restoration, you’ll need to come back to our office to exchange the temporary for a custom crown or bridge.